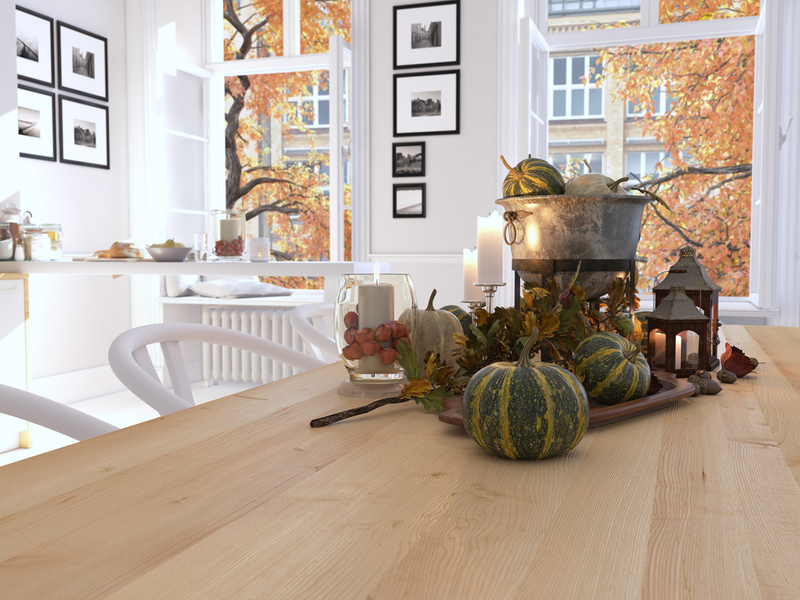 If you don’t have an inch to spare, it can be difficult to decorate your small apartment or loft for fall. That’s why it’s pays to be creative. There are ways to usher in a new season without breaking the bank or cluttering your space. In fact, once the cooler weather rolls in, you’ll be ready for it with some fresh, new design tips. For example, if you want to make your residence smell like fall, skip the scented candles and sprays. Opt instead for an organic scent that you create yourself using common items from your kitchen. You can whip up this recipe on the stove in just a few minutes. Place cinnamon sticks, apple peels, orange rinds, and whole cloves into a saucepan with water. Boil the ingredients for a few minutes before turning down the heat and allowing the pot’s contents to simmer. Keep adding water as needed every 30 minutes or so per Apartment Therapy’s instructions. Moving lighting to a wall can free up space on the floor and tabletops. Refinery29 recommends buying flush mount lamps and installing them in your living space. The website states that silver-tip bulbs illuminate white walls and ceilings well, giving your room a cozy, interior glow. If you’re not keen on wall lighting, try pendant lights instead. They come in a variety of finishes to meet your needs and aren’t hard to install. Best of all, they make use of the ceiling and not the floor which is where a majority of your furniture and belongings sit. Choose patterns that mimic the colors of autumn. Think greens, reds, oranges, yellows, and golds. Find ways to use color to create interest and depth in the space. You’ll create an optical illusion that distracts the eye and makes it think that the apartment or loft is bigger than it really is. Don’t forget to include fall motifs such as leaves, pumpkins, and acorns. You can easily incorporate natural elements into your space, too if you have the room for them. For example, spray paint some pinecones gold and place them in a bowl on your living room or dining room table. Prepare for the new season by making your space warm and comfortable for everyone living in or visiting it. Add throws and blankets in various thicknesses to fight chillier days. Keep the tea kettle and coffee pot on standby for those days where the wind is colder than usual. If you’re crafty, try sewing, knitting or crocheting your own blankets and pillow covers. Choose colors that make people think of fall. Put these items on display on a sofa, chair or bed so others can see how serious you are about fall. If you have items in storage that you want to use for the holidays, let urBin Storage know. We’ll make sure to get your storage bin to you right away so you can take out what you need to decorate your apartment or loft. Your belongings are safe year round in our climate-controlled facility. Best of all, monthly billing options make our storage bins an affordable solution to your storage needs. Don’t hold onto things in your apartment or loft because you think you might need them. Retrieve your belongings when you actually have space to display them properly. When you have storage solutions like ours to choose from, rest assured that your property is protected by being stowed away safely in our storage facility.